If you’ve ever been to the Mediterranean you know that the tomatoes there are like nothing you’ve ever tasted in the U.S. Though I don’t have those tomatoes to cook with I can still create dishes that are luscious, and dream I’m sitting by the turquoise sea while eating them. This recipe was created for the 5 Star Makeover, hosted by Natasha of 5 Star Foodie and Lazaro of Lazaro Cooks. This month’s recipe request is a light Mediterranean Greek Meze or appetizer. My first thought was to make baked olives, a wonderful dish that those who love olives would adore. 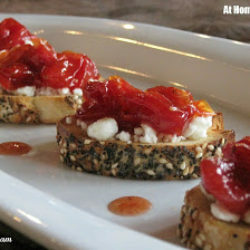 However, vacationing here in the mountains I was unable to find any that looked worthy of using, so instead I created a Tomato Jam that makes a delightfully light, refreshing savory Mediterranean appetizer. Quick to prepare, serve warm, at room temperature or chilled. 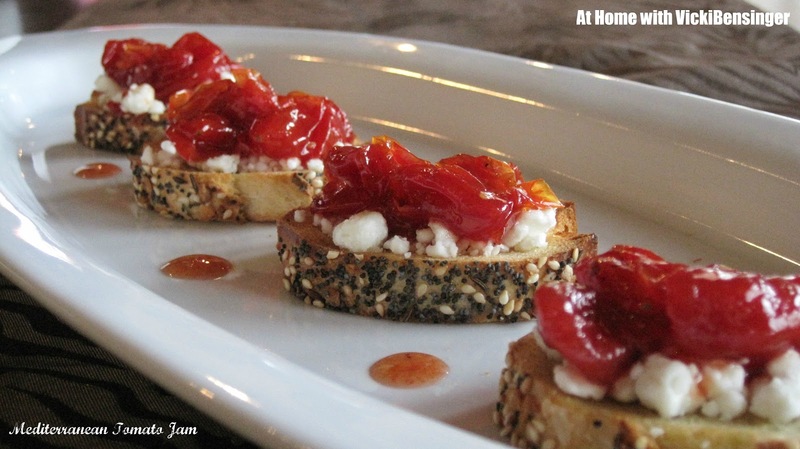 Serve on homemade crostini with goat cheese then topped with the Tomato Jam. Be creative if you like and add some prosciutto and figs or melon, then topped with the jam. Let your palate be your guide.This delightful meze will be gone before you know it, so you might want to make a double batch to have for yourself, once your guests have gone home. It’s so heavenly you’ll want to eat it off a spoon. Don’t take my word for it, try making some for yourself and see! hosted by 5 Star Foodie & Lazaro Cooks! Combine all ingredients except the lemon zest in a stainless steel (non-reactive) saucepan. Cook over low heat to create a simmer for 30 minutes, stirring occasionally - the tomatoes will begin to pop. Turn heat to high reducing until mixture becomes thick - stirring constantly, about 10 minutes. Remove from heat. Stir in lemon zest and set aside to cool completely. Store in a covered container in the refrigerator for approximately 2 weeks. It won't last that long! On a foil lined cookie sheet lay sliced baguette rounds on tray and drizzle with extra-virgin olive oil. Sprinkle with sea or kosher salt. Bake in 400F degree oven for approximately 10-15 minutes or until edges start to brown and bread gets crispy. Serve with tomato jam and goat cheese. Note: If desired, you can add the goat cheese to the crostini after they've crisped up, to melt. Then remove and add tomato jam. 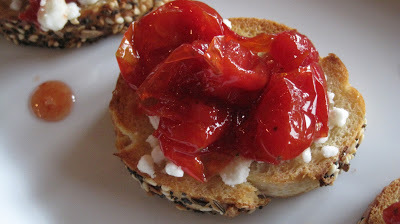 Or after removing crostini from oven, add goat cheese and tomato jam. What a fantastic idea to make tomato jam! I’ve never made it before, but I can totally see this jam being used for a lot of dishes. I like how you made crostini with this. It’s the quick and simple way to enjoy freshly made tomato jam. Oh boy this looks delicious Vicki!! Thanks Nami it is delicious and easy. I can think of so many ways to enjoy this jam too. If you make it I’d love to hear of ways you’ve used it as well. Thanks for your comment. Great idea! I’ve eaten tomato jam before, but never made it. It’s one of those dishes that I’ve actually forgotten all about (it’s been years since I had it). This is so easy there’s no excuse not to do it. Really good post – thank you. It’s incredibly easy and so good. I hope you try it. I want to try this soon. By the way you have a wonderful blog and your pictures are great! I hope you do try it. If so let me know what you think of it. Thank you for your kind words regarding my blog and photos. I appreciate it very much. Have a great day! This crostini looks tasty! I loved the suggestion. Here in Brazil we call this type of tomato as ‘italian tomato’. Yeah, it surely is very tasty! There are so many types of baby tomatoes I decided any variation would work. Here we have cherry and grapes tomatoes among others. In Italy this little tomato is called “Italian tomato,” I didn’t know that. Thank you for sharing that. I hope you will try this recipe. It’s very tasty! It is and we’ve been snacking on it morning, noon and night. Soon I will need to make another batch. Vicki, What a delicious way to make Jam out of tomatoes. 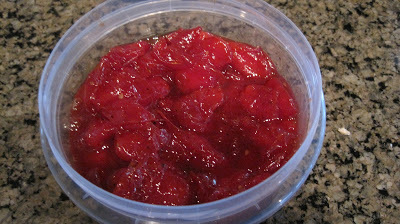 I have made sweet and sour chutney but never thought of using them in Jam. i love the recipe and going to try very soon. Balvinder I havent made chutney in so long but love it. Now I will have to make some. I hope if you try this recipe you enjoy it. Thank you for your comment. A new future experience for me also! Since I love tomatoes, thought I had used them in every possible way, but surely have not made tomato jam, which could be used in so many differing ways 🙂 ! Thank you for your comment. I hope if you try this you’ll let me know what you think. Thank you for this delicious new food! You’re welcome. I hope you love the taste of this simple recipe if you try it. Wait until you try it. Your mouth will be in sensory overload. The flavor IMO is incredible. It makes me salivate just thinking of it. Now I need to go get a spoonful, it’s that good. I’ve been making jams this summer with white grape (100%) juice instead of sugar. Do you think it would work instead of the white sugar? Thanks for sharing. Tomato jam has been on my list for at least two summers. Hi Denise, great question. I don’t see why you couldn’t use grape juice in place of the white sugar. Grape juice is commonly used in making jam and although I haven’t tried this method with the tomato jam I would think it would be fine. Also in most recipes that I’ve seen using grape juice sweetened or not most use pectin. Since tomatoes, which are a fruit, are so high in pectin and are released when heated theres no need to add packaged pectin. I hope this answered your question. If you try it this way please let me know how it turns out. Thanks for your comment. Yep, posting replies to these comments just made me go get a spoonful. It’s so tasty. I hope you’ll try making it. Thank you for your comments. YUM, what about a goat cheese pizza with tomato jam and bacon? That sounds yummy to me. The possibilities are endless! i made a sweet-savory tomato jam last summer that I’m still enjoying and can’t wait to make again! what a fabulous entry! Ooh that sounds great. Please share your link so everyone can try it. Vicki, what a phenomenal idea for a seasonal appetizer! Beautiful and delectable!!! Thanks Liz, it’s so good I can’t stop eating it and now Trix had to mention it with bacon. I may just have to try that instead of the prosciutto. Ooo yummy 🙂 That would keep so well for when I need an emergency tomato jam with some crumble cheddar! I bet that is heavenly with the sweet, caramelized flavors heightened by the slow cooking. I’d smear this on just about anything. I love these quick and easy jams! I make a lot of jam, but I’ve never made a tomato jam. I think you just inspired me to do so. This looks excellent! I’m glad I inspired you. I hope you like it as much as my family does. wow I must try the tomato jam! It looks scrumptious! It is Angie. I hope you like it. Thanks Patty. I think you’ll enjoy this. I know too bad the tomatoes in the states can’t compare. Every now and then we get good tomatoes from our garden Waiting for next batch and ready to put it into jam. Angela I hope you try this recipe, I think you’ll like it. A tomato jam sounds terrific! It was, it’s all gone now. I hope you try it. I agree, it would perfect to can for the winter. I’ll have to do that. Wonderful! It always seems I wait forever to have tomatoes, and then I get them all at once. I love the idea of tomato jam! I have a cherry tomato plant that I believe is on steroids right now. This hot, dry summer has been perfect tomato growing weather. I would love to try this recipe! Yum, Vicky – this sounds and looks delicious, what a great idea you’ve come up with and I love the idea of serving as a bruschetta. I think a bit of fresh basil or thyme would be delightful also. MMM Vicky, love that jam. I can imagine it on a zillion things. Great makeover!! I love the idea of a tomato jam Vicki…very nice, and looks simply delicious! This can be a great party food too! I never make tomato jam in my life. I know..how lame of me! This post put me into a thought of making this jame immedietly as I have grape tomatoes that need to be used soon. That would be a welcome addition to any mezze table! Great addition to the makeover. Vicki, can this be made with larger tomatoes too, or only the cherry/grape types? Are the skins tough or do they soften up while cooking? Going shopping in a little bit, have to pick up tomatoes! Maria if you are planning to make it for crostini then I would definitely use the small baby tomatoes. The skins will soften and they pop however if using the large tomatoes it would be a mouthful, IMO. Plus I think you’ll find you can use the jam for more dishes with the smaller tomatoes. I hope this helps. Please let me know what you think after making it. What a fantastic idea to make jam with these tomatoes. Certainly very versatile. Can be served with so many dishes and so tasty!